Besides the $10 rip-off taxi ride from the airport that should have been about $4, it was really really nice to arrive in Quito. Especially coming from Lima! The air was clean and the sky was clear and blue. I was going to visit Dr. Gustavo Lovato, a friend of mine from AGES ago at the University of Alabama who is now the director of the Casa de la Música in Quito. I would say the last time we saw each other was probably May of 1997. The staff in his office knew I was coming and greeted me with great hospitality. The first afternoon I was there I sat in on some auditions. There was a man playing guitar and harmonica or singing pasillos and there was an Ecuadorian girl studing in Chile who had the most beautiful voice. The operation seems like an excellent venue for musicians to promote both Ecuadorian and European music. Although I no longer remember the name of the place we had dinner that first night, I know it was in the old part of Quito and has outdoor seating and live music on the roof. This was one of those meeting of several worlds and several times dinners. Gustavo and his wife Nancy (who I hadn’t previously met) were going with me to have dinner with two friends from Seattle, Phil and Jeff, who were wrapping up a few weeks in Quito. 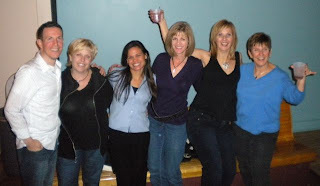 I love reunions of this sort, where you meet people you know from one context in an entirely different one. This was somewhat reminiscent of coincidentally being in Tokyo a few years ago at the same time as my friend Yvette (also from U of Alabama days) for an early morning fish market stroll and sushi for breakfast. The señora del desayuno never disappointed: my breakfasts at Gustavo & Nancy’s were delicious. There was a lovely plate of fresh fruit, fresh juice, and tea. It was in Ecuador where I started to understand the importance of the blender, which I suppose I instinctively was aware of already, given my family’s “beach and blender” nature. I had an opportunity to go with Gustavo to the Universidad de los Hemisférios where he teaches. And I even got to sing. Being with Gustavo and thrown into the world of music and musicians reminded me of a world I love and miss, reiterating the importance of music in my life. Gustavo and Nancy have two polite and apparently well-raised adults. Their 19-year-old son Estéfano, also a musician, offered to show me around. We went up the teleferiQo toward Rucu Pichincha (but not to the crater, since it was getting late and cold). We shared a combi with three Argentinian college girls to La Ronda in the center of the old part of the city and strolled around. There are so many churches to see. They’ll pretty much all have to wait for my next visit to Quito. Estéfano and I sat in the Plaza del Teatro (@ Teatro Sucre) and had a beer and empanada de viento. After getting back home, Gustavo, Nancy, Blanquito (super loving dog they adopted), and I had wine and tostados (toasted corn) and other snacks. Well, I guess Blanquito didn’t really partake. 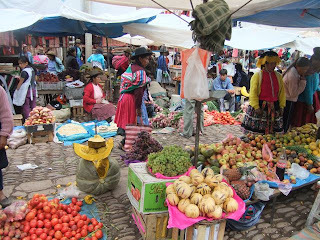 After a breakfast that was fruit-rich and included “algún huevito”, the four of us left for Otavalo, where there is an incredible textiles market every Saturday at the Plaza de Ponchos. Our journey included travel by foot, taxi, then my first experience on a public bus in South America. It was pretty crowded, but I imagine it could be much more so. We went first to have lunch in Cotacachi then moved on to the beautiful Lake Cuicocha for a while before hitchhiking (got in back of pickup truck) to head down to small town near Otavalo, where we got on the bus to Otavalo. The Plaza de Ponchos Saturday market was awesome! I did buy some stuff but definitely wanted more. Without a doubt, I would certainly go back there. Although I intended to make gumbo or jambalaya for dinner, we got back to Quito too late to go get stuff and make labor-intensive southern louisiana dish. Fortunately we weren’t famished because, en route back to Quito, we had bought and consumed some biscoch[oe] de Cayambé from a vendor who came onto the bus. Since I was off the hook for dinner, la Señora de la Merienda/Cena made hamburguesitas w/ mashed potatoes, salad, and jello. Just like that. It was my last night there that I finally got an opportunity to meet Gustavo & Nancy’s lovely daughter Valentina and seven-year-old granddaughter Ashy. Ashy was adorable! After we ate, Gustavo sat down with her to teach her about chess. Meanwhile, I squished stuff into bags and eventually went to sleep so I could be ready for my travels to Galápagos very early the following morning. 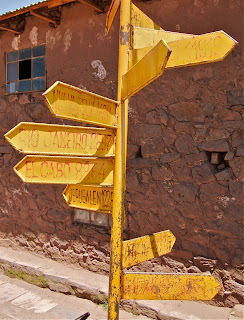 One way to get to Cusco is by tour bus that makes five or six stops along the way. This is the way that we got to Cusco. In total there were seven passengers, our guide Marcos, and our driver aboard a full-sized bus. Besides the four of us, there were three women from Bahia. By the end of the trip I found this out and was speaking with one of them, Solange, a fair bit in Portanhol. It was during this trip that I realized I had a lot more practicing to do before getting comfortable spouting out what I thought to be Portuguese sentences. 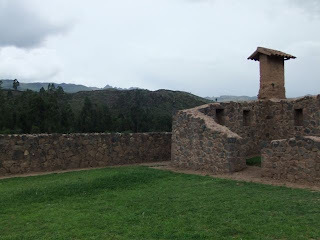 Along our journey we made stops at Pukara (Red Fort), perhaps the town most associated with the creation of twin toritos that peopel put on their roofs to guard their houses. 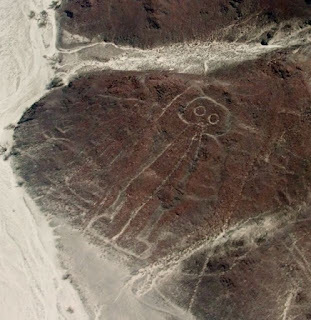 In Pukara I also learned about the chacana, or cruz andina / andean cross, and Hatunyaca, or the Great Decapitator. Importantly, it was here that I first learned about the condor, puma, and snake, and their respective associations with the world above, this world, and the world below. 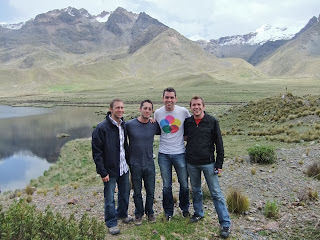 We also stopped for a photo op at the highest point along our route from Puno to Cusco: La Raya. Continuing on, we stopped to check out exemplars of suri alpacas (short hair), huacayo alpacas (long hair), and llamas (longer hair & look much more like horses in facial features). This tourist stop did not have any vicuñas living there. These animals are much more rare and have very expensive wool. 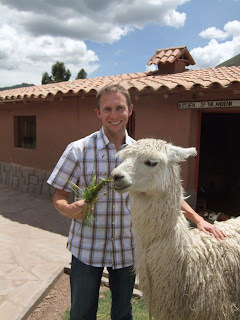 As M, J, S, and I are standing around posing with alpacas and llama and eventually guinea pigs (cuy) in the “Andean Kitchen”, I noticed that the llama seemed a bit more agitated or agitatable than the alpacas. Before long, I’m either petting it or feeding it grass and it tries to start eating my shirt. Note to self: tuck shirt in next time around a llama. At lunchtime we stopped in Sicuani for a tasty and filling touristic buffet. There was an Andean band whose music I bought on CD if only because it was inexpensive and may serve as background for a slide show one day. Really they were no better or worse than any of the ones we see at malls or on street corners around the US (and the world, for that matter). 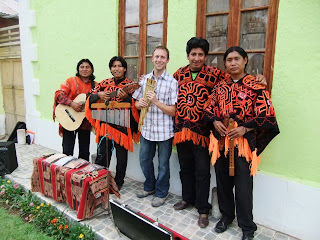 Maybe I’ll try to blend in as an Andean musician as a filler job when I get back to the US. At Raqchi we had a brief stroll around a fairly in tact Inca citadel. Our stop in Andahuaylillas gave us an opportunity to see The Sistene Chapel of the Americas, rightly known as the church of St. Peter the Apostle, and old Jesuit church that still has a functioning pipe organ from the 1700s. Inside this beautiful church, one is not supposed to take pictures or videos. However, Matt sneakily filmed darkness as someone seemed to be warming up or tuning the agèd organ. I haven’t checked yet to see if the sound came out, but it was pretty cool to hear the old instrument wheeze into action. Of linguistic interest, our Peruvian guide Marcos on the bus used vuestros/vuestras several times. My cuiosity was piqued regarding the use of this form in South America. Maybe it’s common and I’m just too long out of Spanish Linguistics classes to remember. Upon arriving at Hotel San Blas in Cusco in the afternoon, we discussed the plans for the next few days with Cecilia, our travel/tour agent, and got recommendations for dinner, drinks, etc. She mentioned her friend Barbi owns a restaurant/bar called Bullfrog’s, which she pointed out to us en route to the hotel. M, S, and J went on a reconnaissance mission to make plans for the night, etc. They met Barbi and decided we’d go there for dinner, so we did. Our waiter made excuses every time he came to the table about why things were - i.e. he was - slow. His friend works there, he’s just filling in for her and has never waited tables before, etc. Eventually we got our drinks. I decided it would be caipirinha night, as I have on several occasions, purposefully foreshadowing the Brazilian leg of this journey. 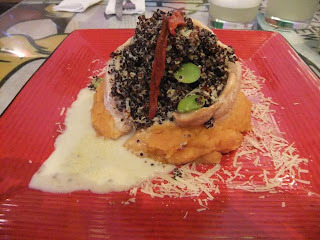 Once our order for food had finally been taken and our lengthy wait (with interim drink) was over, I found before me one of the most curious and scrumptious meals to date in Peru: steamed trout wrapped around black quinoa with parmesan and spinach (I believe) served over a bed of ginger sweet potatoes. Dinner was followed by a greeting from Barbi and discussion of a potential return to Bullfrog’s later. We went to Fallen Angel, a nicely decorated but quiet (that night) bar/restaurant. Instead of continuing to drink, I went for a refreshing blended honeydew beverage and was quite happy with my choice, especially given the topic that came up shortly after our drinks were brought to us. Jason and I spoke at length about things religious, as did the others until they got bored or turned off by the subject. Maybe the name of the place had a role in inspiring our topic. Carlos, one of the couple who owns Fallen Angel, was talking mostly with Matt & Shawn. Shortly after 6am the next morning, J & I woke up and looked across the long quad-bed room, over two empty beds, at each other. M & S were still out. J & I went for a morning stroll rather than waiting around for our recently returned roommates to awake. Just after leaving a note for Jessica & Lisa, two friends from LUC, we ran into them coming back from breakfast. They gave us a recommendation for a spot called Aldea Yanapay, a restaurant whose proceeds benefit an orphanage and school run by the proprietor (Yuri). After another hour or two M & S met us in the square by the cathedral and we headed to Aldea Yanapay for brunch a while later. Although the food was a tad unimpressive - and this was a function of the section of the menu whence the food was ordered - the colorful setting and presence of lots of toys and games made up for any minor lacunes. 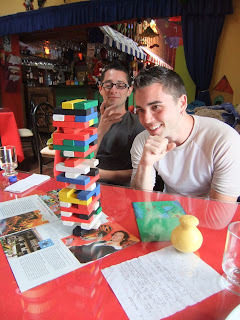 How often does one play Jenga at a restaurant, anyway? 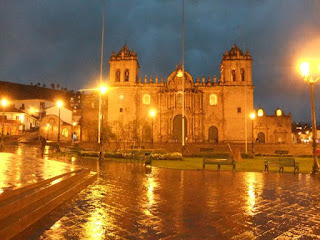 We left Matt to recuperate from his night out and two weeks of hanging out with constant company and went on a city tour of Cusco in the afternoon to the cathedral, Koricancha, and Sexywoman (Sacsaywaman / Sacsayhuaman). During the tour we were conversing a bit with three Australians (Troy, Ruby, Faren) and ended up inviting them to meet up with us for dinner with Lisa and Jessica at a place called Brava. Jess, suffering from altitude sickness, didn’t make it out. The meat was good, but the rosemary potatoes prompted me to ask the manager, when he said that was their normal taste, “you generally serve burnt food to people?” Of course not. Now that was an offensively silly question, David. I must have been drinking to come off that rude with the manager, but oh well. Good thing we were done eating and ready to walk out the door. Pity he didn't take the burnt potatoes off the bill. 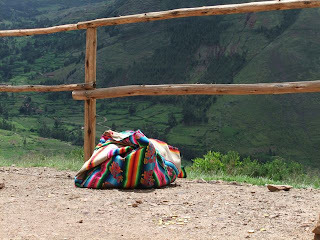 The Urubamba River flows through what is called the Sacred Valley. 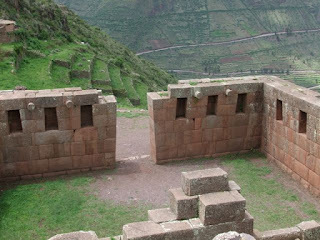 The city of Pisac and magnificent site of Ollantaytambo are found here. The archaeological and historical interest of this area is enormous. After spending the day marveling at Inca technology and craftsmanship and perambulating the market in Pisac, we made our way by train to Aguas Calientes, where we thought we had a room reserved. 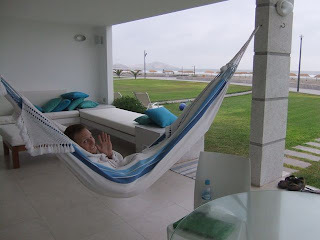 Eventually resolving the fiasco of a missing reservation, we got to bed early and prepared for Machu Picchu. After breakfast at the Eco Inn, we stored our big bags and headed off to the lake with an overnight bag. Mmhmm... repacked & departed. 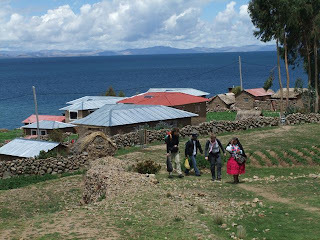 The four of us were taken to the boat, Wayra Cusi, that would carry us around Lake Titicaca for the next 30 hours with our guide Clever & Captain Elias. 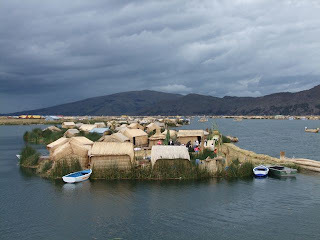 The first stop, about two hours from Puno, was at one of the Uros Islands (Waliqui), part of a network of floating islands made entirely of totora reeds that grow in the lake. Clever and Hugo, the presidente of the island where we stopped, gave a brief presentation about island life then the tourists were whisked off by one of the five families living on the 90’ stretch of “land” to see their dwelling and ideally purchase one or more items they had made by hand. 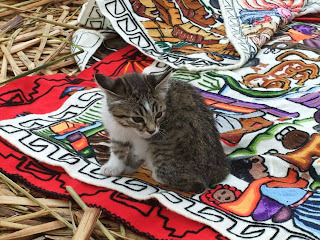 The highlight of our stop on this Uros island was my encounter with a kitten. I think I had seen about 12 cats in total since arriving in Peru, as compared with the 200 dogs I’m sure I’d seen. Maybe if I weren’t predisposed to feelings of guilt, I would have enjoyed the experience more; but as it is, I felt torn about how vaguely exploitative this encounter was until later in the day when speaking with Jason about it. 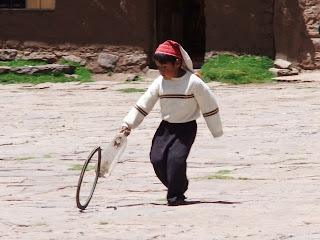 I was led to a slightly different and more positive perspective about the role of the tourist in the life of the Uros Islanders, an Aymara speaking people of Lake Titicaca. Just as a heavy hail storm came in, we cruised on towards Amantaní Island. The Quechua speaking people of this island greeted us warmly, and the passengers of our boat were separated to go with our host families for the night. The four of us were to stay with Sra. Valeria, who, as it turned out, is the wife of our captain. I recognized upon landing that I would probably like this place much more than I had the previous stop. Sra. Valeria led us uphill toward her home. During the walk, S began to feel ill. Altitude sickness had struck. Our host mother started immediately to collect leaves, and S encouraged us to go ahead and leave him there for 10 minutes to try to recover. After showing us our accommodations with very low ceilings, our Sra. Valeria gathered some more leaves from her garden and used them with the ones she had collected to make an infusion for S: ruda, muña, coca, and salvia. This may have been my first sighting of real traditional medicine. We only had coca & muña in our infusions. She also gave S eucalyptus leaves to put under his chullo (alpaca wool hat) which she or her daughter had made. He was sick for pretty much the rest of the day & night. Our lunch consisted of quinoa soup followed by an omelet with rice and potatoes. Very simple, but satisfying with a cup of mate de coca & muña. That afternoon there was a soccer game with the locals, but we opted to go for a short hike up the female mountain on the island instead. At the top there is a temple around which you can walk counter clockwise and make a wish. Various wishes were made. Before descending the wee mountain we had picarones with sugar cane syrup that reminded me of molasses. Really, this was just to give us enough energy to get back home for dinner after a short rest. After a variant on quinoa soup, we had a creamy sauce of potato, carrots, zucchin, and other vegetables over rice. Needless to say, this was followed by a mate de coca. Sra. Valeria and Capitán Elías gave us each a poncho to don with our chullo and then we headed off to the big dance party that was being held in honor of the visitors. A band of andean musicians played a series of long traditional songs, to which we danced in big group circles mostly. A few dances and a beer later, we headed back to Valeria & Elias’ house, even though it seemed Valeria could have “partied” for another hour or so. S had already gone back since he was sick. It was a valiant effort on his part to go out in the first place. Upon arriving at our casa for the night, M, J, and I lay out in the field to gaze at the second most impressive night sky I had ever seen (first was in Namibia a couple of days after arriving at Harnas). Our breakfast the next morning was two light, thin pancakes that were not quite crepes. These we had with either sugar or jam. Obviously, we had mate de coca & muña to drink. 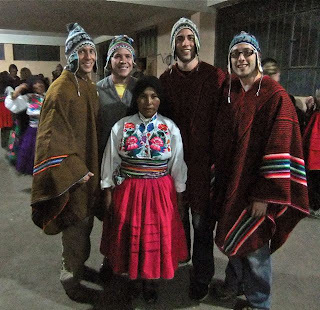 We said our goodbyes to Valeria and set sail for Taquile Island, where supposedly it is the men who knit. The visit to Taquile was relatively uneventful. We were to stroll uphill to the Plaza de Armas, hang out for a while and optionally look at artesanías, then have a fixed touristic lunch. The vistas were indeed pretty, and lunch was tasty enough: pancitos with encebollado, sopa de quinoa, trucha a la plancha with rice and potatoes, and a maté de coca and muña. During the three hour boat ride back to Puno, I stayed mostly on the top deck to get some sun and recharge. Jason & I had our second longish conversation up top. We arrived back to the Eco Inn to clean up before venturing out for dinner at Don Giorgia, which had been recommended to us the day before. This was one of our better dinners as a group. 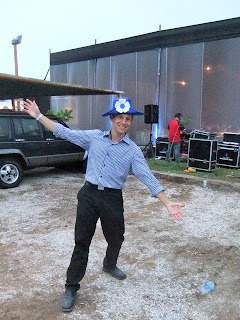 Complimentary pisco sours to start may have influenced this perception. We started off sharing lomito de alpaca (small pieces of loin of alpaca) which were coated with a yellow fine grain and served with rectangular cheese pillows rolled in quinoa cereal. My main was cancacho andino with oca and potatoes. Everyone seemed happy. The bottle of wine (a Peruvian Tannat) we shared may have also contributed to our opinion of the general quality of the meal where the pisco sour left off. Not surprisingly, I ordered a coffee, which ended up appearing on the bill, while the other three in my party got complimentary coffees identical to the one I ordered. For dessert, we shared a wine-poached pear with sabayonne. The following morning we were off to Cusco. Ready, get set, go! In the morning we arrived at Arequipa, having had opportunities to sleep, eat, and watch a movie or two en route from Ica to Arequipa. Most likely due to fatigue from the bus ride and a lack of quality sleep, we chilled at the hotel for a couple of hours in the morning before venturing out into Arequipa. During said chill time, I had already gone out to go get my ticket from Cusco to Lima at the LAN office, noticing on the walk that it seemed a bit more difficult to walk around. Had we gained altitude, or was I just exhausted? Once everyone was ready, we went to the Cathedral then stopped for the apparently requisite late morning Pisco Sours M & S would have. All things considered, and with hindsight to help, we should have stopped for lunch then but forged ahead anyway, largely perhaps because I wanted to get to see the Monasterio de Santa Catalina. 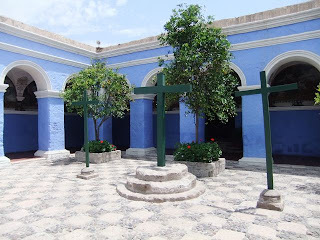 This is a Dominican convent from the 1600s where initially the novices were living in comparative luxury, complete with servants, china, and fine linens. Since these were typically the second daughters of rich families, the wealth of the family dictated the comfort of the girls. 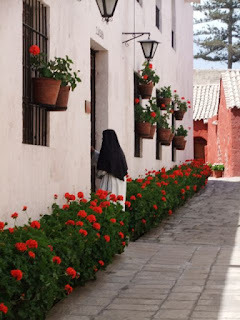 Eventually the vatican and a strict mother superior changed all of this, but the result is that a beautiful city within a city was created in the middle of Arequipa. Our late lunch was held at Chicha, part of the Gaston empire of restaurants, in the Casona de Sta Catalina. Given the tardy start to lunch, cocktails were only reasonable. If only I could remember what I had! It was a fruity delicious thirst quencher. 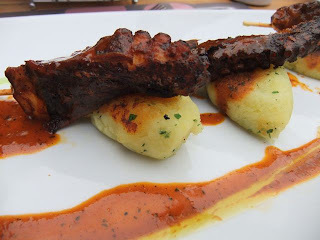 After sharing a piqueo de mariscos, I had anticuchines de pulpo over toasted querelles of mashed yellow potatoes. 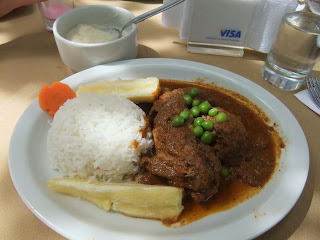 M had a pastel de choclo de maís, a sort of corn quiche/casserole with shredded beef inside. J had traditional arequipeño adobo. S had - surprise! - ceviche. It seems he had been having pisco sours and ceviche everywhere he went for the past several days. It would be discussed the following day that he might consider having something other than ceviche for at least one meal, his digestive system issues might be cleared. After such a grand almuerzo, we all needed siestas. Eventually around 7 or 8 we managed to work our way back to the streets, obviously with less hunger than would dictate having dinner. I noticed a few places that had queso helado, a traditional arequipeño ice milk. Although I should have just gotten one and said “screw dinner”, I forged ahead not wanting to spoil my appetite. Silly! 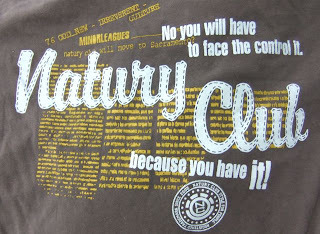 Eventually we stumbled upon a cheap t-shirt store due to a curiously gangsta mannequin outside and strolled out each a couple of t-shirts richer. By the time we finished a drink or two at a bar with decent lighting and good artwork, it was already close to 11pm and hard to find an open restaurant on a Monday night. There was a cheap Turkish sandwich & light fare place open that J & I were ok with but then got drawn by the others to a place down San Francisco called Mystica that was still open. The menu of the day looked appetizing but seemed like it would be too much. No one was eating there, but no one was really still eating anywhere except for a couple of pizza places. For some reason, the menu of the day was no longer being served, but one could compose it oneself by ordering a la carte. Tant mieux: who needed all of that food anyway! M & I ended up getting one of the mains from the daily menu. By the sound of it, a promising dish: lasaña of rocoto relleno. 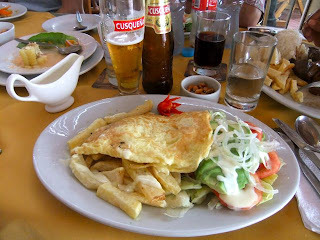 Rocoto relleno is a traditional Peruvian dish: somewhat spicy pepper stuffed with seafood & cheese. Deconstruct it and turn it into lasagna, layered with one of the 4000 kinds of potatoes the country is known for. Having had this restaurant’s deconstructed version of it, I’d describe it more as frozen seafood that was overcooked and layered with potatoes and peppers. Next morning at 8:30 we had a bus to Puno. Repack & prepare for departure! After hearing some frightening tall tales of bus travel in Peru from Katia, Ericka, and friends, I was a bit trepidatious about jumping on a bus that stops on the highway at night for people who flag it down. Nevertheless, I had to get from Playa Asia to Ica to meet up with Matt, Jason, and Shawn. After a somewhat cramped and toasty three hour ride, I met Matt & co. at Discoteca The Who, where I had one or two Machu Picchus (yes, I managed to have Pisco, even after the events of three days prior) and a bit of dancing and people watching. The next morning the four of us headed off by hired car to Nazca, where we were to get on a wee avioneta to fly over the famous Nazca lines. 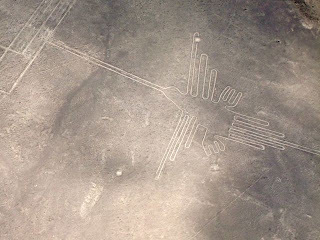 If forced to say so, I’d have to confess that flying over the Nazca lines was not as incredible an experience as I might have liked, considering how into such things I used to be. If you’ve seen a Discovery Channel or National Geographic special about the lines, then you’re good to go. 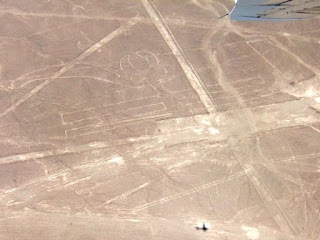 In retrospect, while on the ground you don’t really get an idea of the size of the drawings or even know you might be in the middle of one (if you were allowed to be in the middle of one), from the sky you don’t really get a sense of how big they are, except that they’re visible as identifiable objects. Basically, it’s a problem of perspective. It might have been nice to spend a bit of time that day studying the history and mystery of the lines and their discovery. On the way back to Ica, we stopped for lunch and a vineyard/pisquería tour at Tres Generaciones vineyard & distillery, which is also the home of La Olla de Juanita. YUM! 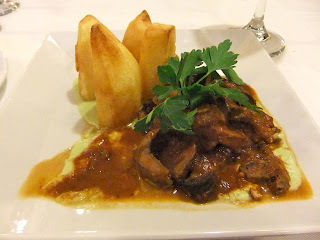 Ordered chicharrón, ensalada de pallares, encebollado, seco de cordero with morusa de pallares. We tasted about three different qualities/types of pisco before two gave up and headed back to the table to see if our order was ready. Here we also had for the first time tuna: no, not the fishy, sashimi grade or hockey-puck dry cooked fish or squishy canned stuff - the prickly pear kind that makes a tasty juice. We headed back to Ica, to Matt’s cousin’s apartment, with Taxioke (or Carioke) en route. Our bus for Arequipa was to leave at 8:30. Gentlemen, please repack and prepare for departure! How ever did I make it to Asia? While I wished all of the LUC gang, the Sotho, and the Peruvians in SFA a very happy New Year, I was content to be taking a break from the the cold water of our port-o-potty-sized showers and ubiquity of sand there. Hector dropped Christine and me off in Lima, where she and I repeated the LUCOF tour from two Saturdays prior but at a slightly slower pace. 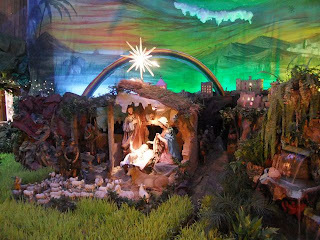 We also added into the tour a stop by the Nativity Scene a la Rainforest Cafe visit at Nuestra Señora de la Merced church. Once Hector got Keith from the airport later in the afternoon, he met up with us and the four of us went for a drink in Miraflores. To make a long story short, I left the table about 1.5 pisco sours into the night and didn’t ever make it back. Someone eventually found me, and Keith started feeding me pepto bismol. I don’t recall ever consuming 10 pepto bismol chewable tablets to alleviate this sort of problem, but I was in no state to argue effectively. I was pretty much carried to Hector’s car and taken to Ericka’s house at Playa Asia, not without an incident or two along the way, apparently. Poor Hector! That night I slept for a couple of hours curled up in a ball propped up against the wall in the shower. Not exactly comfortable, but definitely comforting! 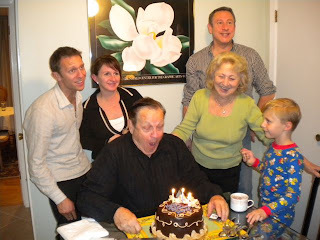 I woke up on 31 December 2009 feeling not entirely horrible. After relaxing in the hammock for a while, I slowly made my way with the others off to The Boulevard mall complex for some shopping. Did I need a new bathing suit? Really? Obviously! For lunch that day back at the beach house, I tried my first Peruvian causa. Yellow potato stuffed with ingredients. In this case, one with octopus, one with langostino, and one with crabmeat. Around 5:30 or 6 the buzz of decorating the house for the pre-party started. I realized I probably wasn’t going to actually get a disco nap in before New Year’s Eve festivities began. 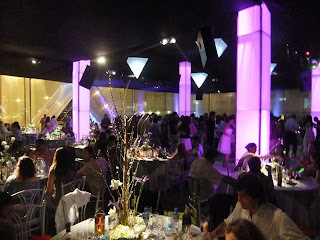 Decoration included creating floating candles for the soaking pool all’improviso out of used plastic water bottles. The result of our [or mostly Keith’s] efforts was glorious! 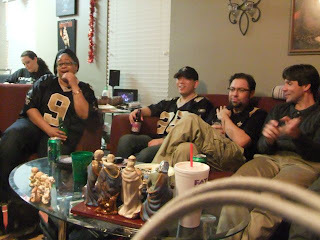 Several of Ericka’s friends came over for snacks and drinks before we were to head to the clubhouse party after midnight. 10, 9, 8, 7, 6, 5, 4, 3, 2, 1, Happy New Year! Time for grapes & wishes: 1, 2, 3, 4, 5, 6, 7, 8, 9, 10, 11, 12. A few calls were exchanged between the US & Peru at this point. Of course, Mike called right at Midnight Peru time, thoughtful chap that he is. Of course, my parents called right after, loving padres that they are. 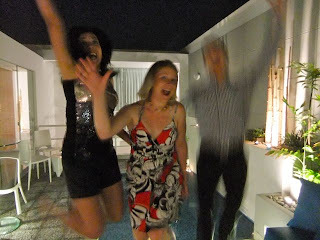 The party that we walked to at the beach club after leaving Ericka’s reminded me so much of the Endymion Extravaganza. There was finger food, booze, good people, and groovy music (from Abba to merengue to R&B to cumbia to mambo to reggaeton) from 12:30 til 6:30. Around 4:30 or so the aguadito de pollo (a.k.a. levanta muertos) so we could make it another 2+ hours. There exists a New Year’s tradition of running into the ocean, possibly wearing clothes you were partying all night in. Our modified version involved stopping at the house on the walk to the beach and changing. In we went! Shortly after what would otherwise be an invigorating dip, people collapsed into various sleeping spots. I took the hammock! After two hours of sleep, I changed into my new bathing suit to take advantage of the sun. Pretty much the entire day was spent lounging in the glare until the task fell upon me to do what the Rojas family, as beach & blender people, would do well: make improvised piña coladas. 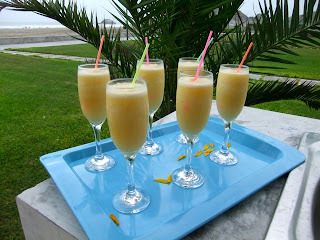 There was maracuyá (passion fruit) sorbet in the freezer, so we had maracuyá-piña coladas, ordered lunch from the club, and lounged some more before playing cards that night. There would have been worse ways to spend day 1 of 2010. My last day with Ericka, Shel, and the bunch at Playa Asia was also a good one: Ruben, Ericka, and I went for a jog in the morning, then we crept off to The Boulevard for lunch. I had my first pescado (corvina) arrebosado here: basically, fish fillet enveloped in a thin omelet, obviously served with rice AND potatoes. There was a cosmopolitan toast of despidida then off to Ica by highway-stop bus I went to meet up with some Seattle [+1 CA] boys. It felt like such a long time since I had been home. The last day in Amman I could only think about how excited I was to be going back to New Orleans to see my family, friends, and an inspriningly loving guy named Mike who would happen to be there for a conference just before Thanksgiving. My sister was originally the only person in NOLA who knew I’d be coming in. A couple of weeks prior I decided to give her the ok to tell my brothers in case they could make it in for any of the family celebrations that take place in the last week of November every year. I’m very glad I did. Steve & Rory made it in for the first weekend I was there, to celebrate my Dad’s 75th birthday and Jeff & Susan made it in a few days later to celebrate my parents’ anniversary. It was an incredibly reassuring experience to be so delighted to be in New Orleans again, and I was thrilled to be able to show Mike and his speech pathologist comrades around a bit. 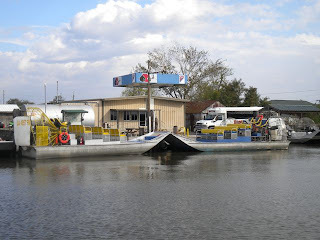 Probably the highlight of tourism at home was an airboat trip (Airboat Adventures) on Bayou Barrataria & environs after a very wet morning and a previous day that saw at least one member of the group rallying (where’s my beer?) after about 60 oz of bloody mary from Port of Call. Debbie, Heather, Mike, and I had a blast with our guide named Steve and his little friend Bud cruising around the swamp & marshlands wearing big yellow earphones. A very close second was a trip to the Audubon Zoo with Joel and Mike. I was wanting to take Joel to the zoo when I got in town ever since I was still in Africa. Of course, it was unclear how I would react to being at a zoo for the first time after my experiences at Harnas and with African Impact's Lion Rehabilitation project. It was a fantastic day, but I probably would have preferred to stay the night and spend another day there with the animals. The time with out of towners, both friends and family, unfortunately flew by. Thanksgiving came. I think I stayed up all night the night before Thanksgiving (the first of many nuits blanches in which I didn’t do anything but hang out at my parents’ house in the Big Easy) and started preparing food around 7am. The up-side to this was that I was in the kitchen all morning and mostly with no other contributing chefs ... couldn’t imagine a better place to be. Another positive outcome was that we were eating at 3pm and there was none of the typical “when are we eating? it will be Christmas soon” comments. There were two programs on WYES TV on Thanksgiving, which we watched after most of the Macy’s Thanksgiving Day Parade. 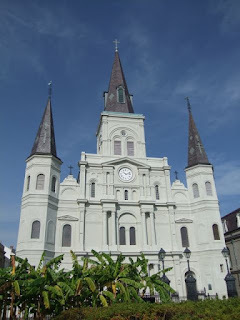 They focused on culinary traditions in New Orleans. I was captivated, and my parents ended up pledging to the public television station so that we could get copies of the programs. I’d have to say that I watched more professional football during the three weeks I was at home than I have in maybe 10 years or more. The Saints were on a roll and it was very hard not to get caught up in it. This presented some great opportunities to spend time with my best long-standing friends from Jesuit and a few chicas that came into the picture later in the game. Whenever I go home it’s a comfort to see them and be comfortable with the familiarity of our friendship. 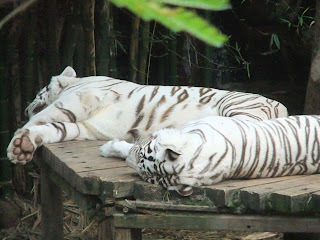 Generally there’s always a rushed feeling to our encounters, but this time I was able to see several of them on different occasions, from pizza and Saints at Robert & Gina’s house to pizza & Saints chez Fong to a tour & tasting session with Joi & Sarah at the Old New Orleans Rum Distillery. 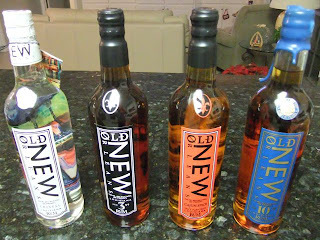 By the way, if you tend to order rum drinks and are in a place that you think might have a certain selection of rums, PLEASE ask for Old New Orleans rum by name (Crystal, Amber, Cajun Spice are all quite nice and are available in several cities around the country. I’ve appointed myself ambassador for them, so I’m spreading the word.